I've been following Katie Pederson for a little while. She and I have a mutual friend in Seattle, Krista Withers, who used to belong to Block Party Quilters with me. Krista first introduced me to Katie in Portland during a book signing at Quilt Market. She wrote a fabulous book, "Quilting Modern: Techniques and Projects for Improvisational Quilts" with Jacquie Gering and was signing it at Quilt Market. I ran into Katie a couple of years after that when she was the featured quilter at the Walla Walla quilt guild show. I loved her quilts and promptly made one based on a picture that I had taken. Then, when it came time to recommend someone to come to our guild for a lecture and workshop, I recommended Katie. So, I was over the moon that I was able to listen to her lecture and then take a class from her this year. She taught us her class, "Double Trouble". It is a half square triangle quilt with a modern twist that she came up with. I loved her humor, energy, and personal attention that she bestowed on all of us. If you can catch up with her, you should definitely consider taking a class. You'll love it! I made most of the blocks during the class, then played around with it a little bit and added a few more blocks. Here is the finished top which measures 50" x 60". I hope that you belong to a quilt guild that also brings fabulous speakers and teachers right to your doorstep. The distribution of color is nice. 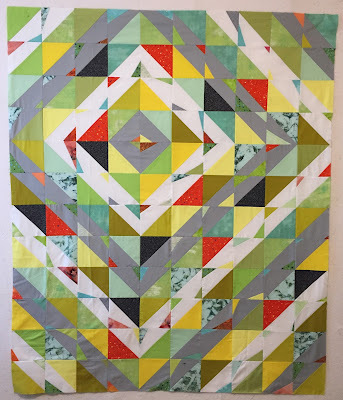 Isn't it fun to support fellow quilter friends?